Any company that uses market input to tweak its product offerings is making a wise decision. In other words, being committed to solve the customers’ problems and customizing product offerings is a must. But how do companies do it. A good starting point is identifying what customers are really trying to achieve. A narrow-minded approach would limit a supplier to specific products the customer is buying. A research has found that customers quietly dump the suppliers without complaining (TARP research has found a 1 to 26 ratio for every customer who complains to those who do not). 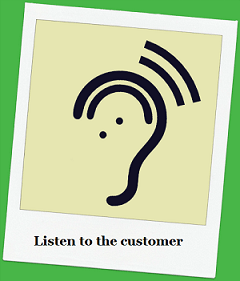 So it is very important to ask the customer what they want and get their feedback on various issues they are facing. Among many ways to listen to the customer like surveys, standard forms, observation, interacting at point of sale, net promoter score or via social media, a combination of all might work to the best advantage. There is no one best solution. Let us see how some companies e.g. Apple, HP and Xerox are listening to their customers. Does Apple listen to its customers? The above two quotes made by two great leaders contrast each other w.r.t listening to the customer. You may ask, “So does Apple not listen to its customers?” The answer, it does, perhaps in its own unique way. In their book, authors Fred Reichheld with Rob Markey, describe in detail how Apple advocates the Net Promoter Score (NPS) for methodically listening to customers. The NPS concept tracks promoters (i.e. those who will recommend the product or service to a friend or a co-worker) and detractors on a 0-10 point scale. NPS is used for daily management of Apple’s stores and evaluate store performance and correspondingly make improvements. A central NPS team is responsible for analyzing customer feedback from all the stores. The analysis reveals reasons for a promoter’s keenness or a detractors disinterest as per the NPS concept. The store managers then call every detractor within 24 hours as findings suggest that they purchase significantly more Apple products and services than the others. An hour spent on calling detractors was fetching more revenue with additional sales. How HP listens to its customers? Procter & Gamble (P&G) wanted to digitize and use technology for business decisions. In 2003, HP began a 10 year contract to manage P&G’s internal tech services. In 2012, when the contract came up for renewal, P&G wanted to make its IT operations stronger and work with offerings from many vendors. HP was open to the deal. So in cases where HP’s hardware or offering did not meet P&G’s requirement, HP was willing to work with other vendors to fill the gap. HP and P&G realized that this would make the IT operation stronger. As a result P&G extended the contract for five more years and a 50% increase in annual value. HP researchers are also known to visit the customer location and film the business process for a day so as to suggest how HP could help them. HP is also known for its “Day in the Life of a Customer” concept. How Xerox listens to its customers? Xerox listens to its customers via Relationship Surveys, Transactional Surveys and social media. It uses facilities like Real-time alerts and processes involving Lean Six Sigma techniques to addresses customers’ requirements. The company has programs like the ‘Xerox Corporate Focus Executive Program’ to build relationships with its top 100 accounts. In another program, 36 company officers take turns to be “Customer Care Officer of the Day” to listen to the customers and solve their problems. Xerox conducts business live events across the country like the “Xerox Focus Forward”. These events are aimed to connecting Xerox with current and future Xerox customers and explore opportunities. The event shows its customers how Xerox can help solve real business problems.